1.1 The full name of Non-entrepreneurial (Noncommercial legal entity) in Georgian is “ saqarTvelos qalTa biznes asociacia”; in English “Georgian Women Business Association” (GWBA). 1.2 Nongovernmental organization “Georgian Women Business Association” (hereinafter organization) is Non-entrepreneurial (Noncommercial legal entity) created in compliance with Georgian Civil Code, the purpose of which is the improvement of economic state of women, activation of women in business, promoting the protection of gender balance. Organization is acting in compliance with Georgian constitution, legislation and resent charter. 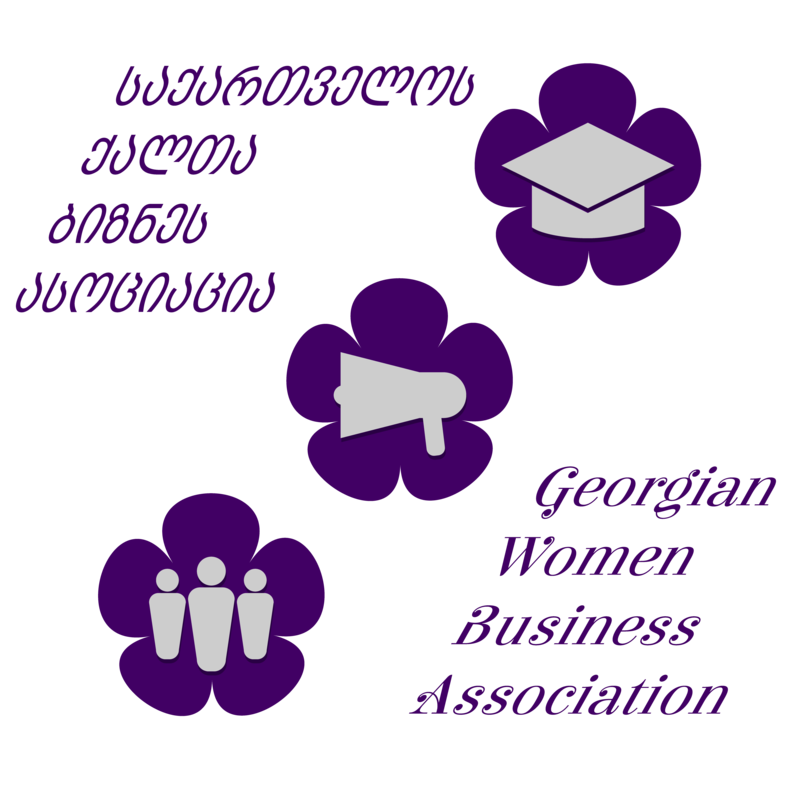 1.3 “Georgian Women Business Association” is an independent organization that has property and balance, settlement and currency accounts in Bank, seal, logo and other corresponding symbolic. 1.4 Organization address: Petriashvili street #30a, Tbilisi. 1.5 Organization is operating in Georgia as well as outside of its borders. 1.6 Organization is authorized to perform entrepreneurial activity of subsidiary character, the profit received from which has to be spent on the realization of its purposes. Distribution of profit gained by such activity, between the founders, members, donors or organization, also persons having management and having representative authority is unacceptable. 1.7 Alienation of property being in ownership of organization is possible, if the alienation serves the organization goals, its organizational development, promotes the implementation of its goals or serves charity goals. 1.8 Organization is created for indefinite period of time. 4. To improve the climate for entrepreneurship and small business at the local, state, national and international levels through participation in the public policy-making process. 1. To provide a system for sharing and disseminating information on and of interest to women business owners. 2. To foster training, technical assistance and other learning opportunities specifically oriented toward the needs of women business owners. 3. To serve as a vehicle for making group benefits available to members of the Association. 4. To increase the general visibility of women business owners. 2 MAREKHI GURULI 29.10.1978 20001002523 Gldani 3a M/D, building 22,apt 80. – Other rights set forth in the legal acts of the Association. – Other responsibilities set forth in the legal acts of the Association. 6.1 Fiscal Year: The fiscal year of the Association shall be from January 1 through December 31. 6.2 Amount of Dues: The Board of Directors shall determine the annual dues for all classes of members prior to the beginning of each fiscal year. 6.3 Refund of Dues: No dues shall be refunded to any member whose membership terminates for any reason. The Board of Directors governsthe affairs of this Association. The Board of Directors shall hire an Executive Director who will manage the association. The Board of Directors may authorize any officer or officers, agent or agents of the Association, in addition to the officers so authorized by these by-laws, to enter into any contract or execute and deliver any instrument in the name of and on behalf of the Association and such authority may be general or may be confined to specific instances. Checks, Drafts, or Orders: All checks, drafts, or orders for the payment of money, notes, or other evidences of indebtedness issued in the name of the Association shall be signed by such officer or officers, agent or agents of the Association and in such manner as shall from time to time be determined by resolution of the Board of Directors. In the absence of such determination by the Board of Directors, such instruments shall be signed by the treasurer and countersigned by the president or vice-president of the Association. Deposits: All funds shall be deposited to the credit of the Association in such banks, trust companies, or other depositories as the Board of Directors may select. Gifts: The Board of Directors may accept on behalf of the Association any contribution, gift, or bequest for any purpose of the Association. Budget: The Board of Directors must adopt an annual budget for the ensuing year by the beginning of the fiscal year. The Board of Directors shall consist of the elected Officers as set forth in Article 8 and all duly-elected Directors. The Executive Director is an ex-officio, non-voting member of the Board. The Board will consist of not less than nine (9) and not more than fifteen (15) Directors. – The Board of Directors shall hold at least three (3) regular meetings per year. Regular meetings may be held at such dates, times, and locations as are chosen by the Board. – Special meetings of the Board of Directors may be called by the president or upon written request of one-third of the board. – Quorum: A majority of the total voting membership of the Board shall constitute a quorum at a regular or special meeting, provided that at least two (2) officers are included. – Members of the Board shall receive at least twenty-four (24) hours advance notice, either written, by e-mail or by telephone, for special meetings. – Compensation: Members of the Board of Directors, with the exception of the Executive Director, shall not receive any compensation for their services. – Meetings by telephone or teleconference: Directors may participate in a meeting of the Board or a meeting by phone or similar communications technology in which all persons participating in the meeting can hear each other at the same time. Such participation shall constitute presence in person at the meeting. – Action without a meeting: Any actions required or permitted to be taken at a meeting of the Board or any committee of the Board, with the exception of the Executive Committee, may be taken without a meeting if consent in writing, setting forth the action to be taken, is approved by a majority of Directors. Such consent shall have the same force and effect as a vote taken at a meeting and shall be filed with the records of the proceedings of the Board or committee. Consent in writing may be given by email, fax or other written communication. The officers shall be The President, Vice-president, Secretary and Treasurer. Officers must be members of the Board of Directors who have served at least one year on the Board. The Officers shall have such powers and shall perform such duties as may from time to time be specified in resolutions or other directives of the Board of Directors. In the absence of such specifications, each Officer shall perform and discharge the duties of Officers of the same title serving in non-profit corporations having the same or similar general purposes and objectives as this Association. If at any time an Officer cannot serve her full term of Office, the Board of Directors shall appoint an eligible member to fill the vacancy for the unexpired portion of the term. Establishment of a Nominating Committee shall be initiated by the Board of Directors. This chair shall be charged with creating the Nominating Committee, up to a total of six participants, comprised of GWBA members, as possible. The Nominating Committee shall present to the President one nominee for each vacant Officer position and each vacant seat on the Board of Directors at least thirty (30) days prior to the annual meeting. The names of all candidates shall be e-mailed to each voting member at least ten (10) days prior to the annual meeting. Officers and Directors shall be elected by a majority of eligible votesevery 3(three)yearsat the annual meeting of the Association. If no nominations are received from the floor the election may be held by voice vote. Otherwise, the election shall be held by secret ballot. A member of the Nominating Committee shall serve as election judge and shall appoint one teller. Together they shall prepare the ballots and tally sheets. Proxy votes received by the Nominating Committee at least 48 hours prior to the annual meeting shall be accepted. If the election does not take place at the annual meeting as stipulated above, then the election of Officers and Directors shall be held by mail or e-mail ballot or at a special meeting convened as soon thereafter as is convenient. Officers and Directors shall assume duties at the start of the fiscal year immediately following the election. The term of Officers shall be Three ( 3) years. An Officer may serve up to two (2) consecutive terms. The term of the Directors shall be three (3) years. A Director may serve up to two (2) consecutive terms. Any Officer or Director may be removed from office for good cause, e.g., violation of her official duties or infringement of these by-laws, or a failure to attend a majority of the board meetings each year. Charges against an Officer or Director must be given in writing to the Board of Directors. The Board shall decide by majority vote whether to recommend removal of the Officer. A vote for removal shall take place by secret ballot at a special or regular meeting of the General Assembly. A two-thirds majority vote is required for removal. 10.1 The company reorganization is executed according to the Georgian legislation. 10.2 The company’s liquidation is executed as the result of achieving the company’s goals, on the basis of the guilty verdict delivered by the court on the criminal case, on the basis of the bankruptcy or according to the article 381 of the Georgian Civil Code. 10.3 After the liquidation of the organization, all the schemes should be closed, should be defined the requirements, the rest property should be expressed in money, satisfy all the creditors and the rest property should be given to the responsible persons. 10.4 The members decision about starting the company’s liquidation process should be registered in the entrepreneurial and non-entrepreneurial (non-commercial) registry, the liquidation process is regarded as started after the moment of its registration. 10.6 Distribution of the property rested after the company’s liquidation is forbidden between the company’s founders, members, leaders and representative persons. 10.7 If the Association founders/representatives didn’t define the person who will be responsible for receiving the association assets after its liquidation, the court will transfer this property to other relevant one or several non-entrepreneurial (non-commercial) legal entities, which have the same purposes as have the liquidated non-entrepreneurial (non-commercial) legal entity itself. If such organizations doesn’t exist and or is not able to find such company, in this case should be delivered the decision about transferring this property to the state. The court can distribute this property after six month of registration the company’s liquidation process. 10.8 The liquidation is executed by the responsible person (persons) or other liquidator appointed according to the established law. The liquidator is responsible as the head and representative authority person. 11.3 The organization is allowed to have the ownership over the buildings, equipment’s, inventories, vehicles, monetary funds, securities and other assets, which are necessary for fulfillment of the charter’s aims. 12.1 This charter (members agreement) comes into effect after its signing by all members. 12.2 If any provision of this charter (members agreement) becomes invalid, this will not affect the authenticity of the other provision of the charter. 12.3 In case of any misunderstandings between this charter and Georgian legislation, legislation is effective.